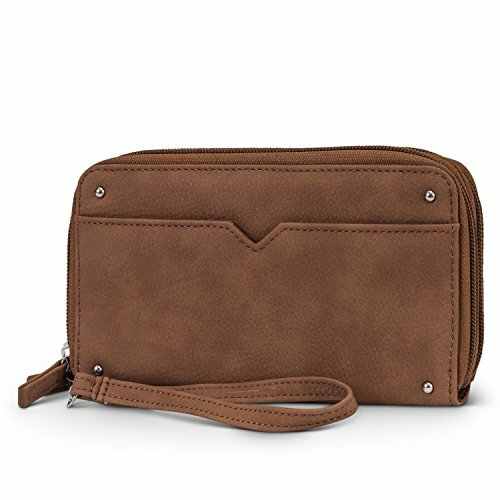 Searching for a vegan wristlet wallet? Then you've come to the right spot, We've rounded up 10 gorgeous options that are made faux materials and no animal products. Ladies, if tiny wallets just don't have what it takes to be your trusty sidekick, try Matt & Nat's Mercer wristlet wallet. Made of black vegan leather with a foldover flap featuring an interesting bark-like pattern. Constructed with three cash pockets, 18 card slots and a zip coin pouch. Advertised as vegan: Yes. Matt & Nat is PETA-approved. Pros: Toss everything but the kitchen sink into this wallet. It'll hold your money, your phone and some purse goodies with no trouble. Cons: It's a bit pricey. With one zippered compartment for your money and one for the other essentials, this wallet is heavy-duty. Made of supple brown vegan leather. Designed with 14 card slots, ID windows, slip and zip pockets and expandable accordion pockets. Pros: It's a fantastically organized wallet that's sure to suit your budget. And it's got RFID technology if data theft is a concern. Cons: We can't attest to the RFID tech's rating (though it certainly may be top-notch). The embossed pattern in the charcoal gray faux leather gives Roxy's Won My Heart Wallet a delicate quality. Zips all the way around. Comes with a detachable wrist strap to convert to a clutch. Made with a generously sized inner zip pouch, card slots and a clear ID window. Advertised as vegan: No, but it's faux leather. Pros: This is a take-anywhere sort of vegan wristlet wallet if you don't feel like carrying a hefty purse. It's graceful and suitable for any occasion or attire. Cons: None that stand out. Velvet has never been more popular. This wallet is super soft and gorgeous in crushed black velvet. Made with multiple card slots, an ID window and an outer coin pocket. Closes with a metal snap. Advertised as vegan: No, but the materials are all synthetic. Pros: You'll love that roomy zip coin pocket that's so easy to get in and out of on the outside of the wallet. Of course, you'll probably love the whole thing—crushed velvet is so dreamy. Cons: It could potentially gain bulk quickly from loose change and other items you'll be tempted to stash in the zip pouch. 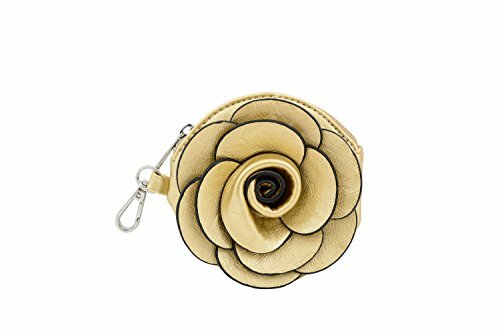 A little wristlet wallet like this one is not only too cute, it's very practical for errands or travel days when you need to keep change, cash and ID at the ready. Embellished with a faux leather rose. Pros: Stash anything from change to lip balm in it. It'll hardly take up any space at all, even in a mini purse. Cons: It's great as a change pouch or a travel buddy, but it's probably not big enough to replace your everyday wallet. 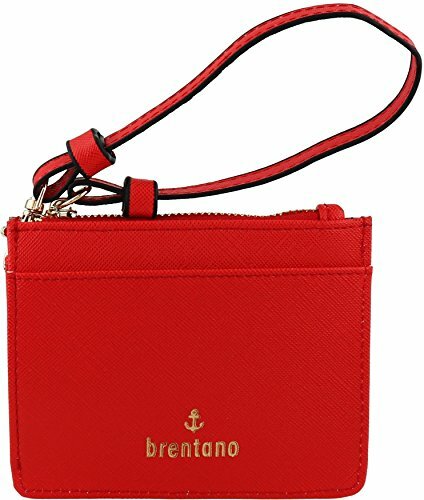 Somewhere between a wallet and a coin pouch, this cherry red faux leather wristlet wallet is excellent for getting across town on public transportation. Just toss your tickets in the outer card slots. Slim enough to fit comfortably in your pocket. Zips up and wraps around your wrist for safe keeping. Pros: For a minimalist wallet, it has plenty of convenient features like a zippered coin and cash area, card slots and a clear ID window. Use it anytime you need to get at your ID, cards or travel tickets on the fly. Cons: It's definitely on the small side. 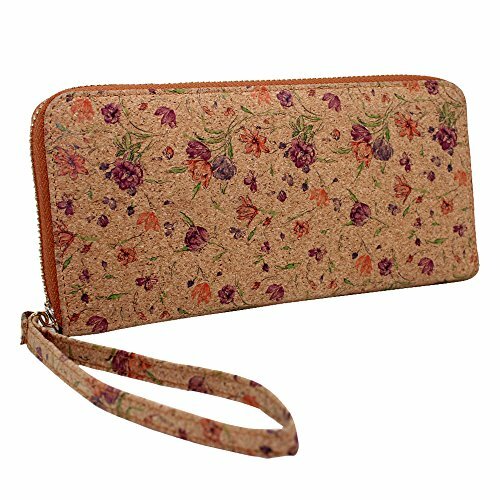 Boshiho's vegan cork wristlet wallet has a feminine touch with an allover floral pattern. Constructed with eight interior card slots, a zip coin pocket and two bill compartments. Pros: It's lovely to look at and a pleasure to use with well-planned organization inside. Cons: It might not hold the largest cellphones on the market. Be sure to take measurements. Variety is the spice of life, as they say. 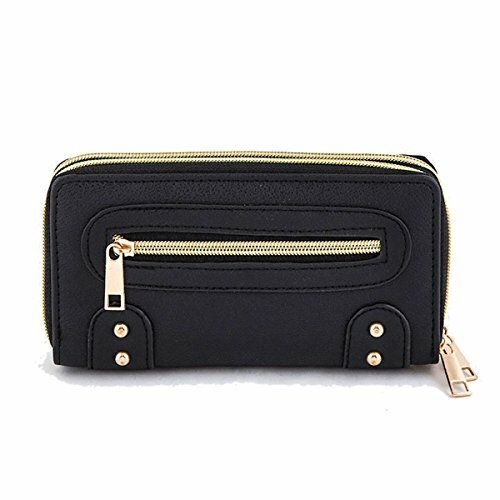 You have the option of using this wallet as a crossbody purse or as a wristlet with two detachable straps. Stunning in grape microfiber material and faux leather trim. Comes with an ID window, card slots and a zip coin pouch. Capable of carrying a variety of iPhone sizes. Advertised as vegan: No, but the materials are synthetic. Pros: A purse and wallet in one is such an practical idea, isn't it? That's essentially what this wallet it, especially worn as a crossbody bag. Cons: It's decently spacious, but it does have limits. 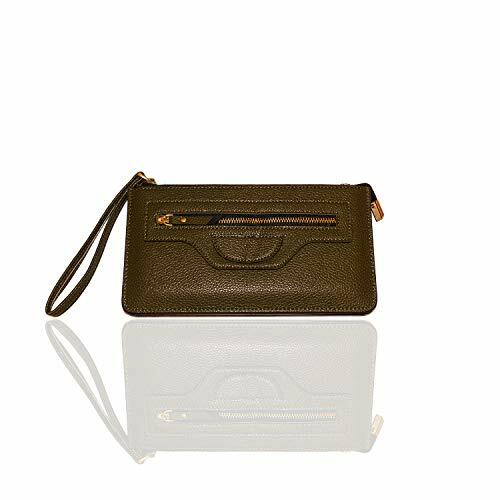 Made of soft vegan PU leather, this olive green wristlet wallet can hang onto quite a fair amount for you. Advertised as capable of fitting any size iPhone. Designed with eight card slots and three internal compartments. Pros: For all that function and style, it's a steal. It looks like a high-end wallet for a fraction of the cost. This wallet comes with two main zippered sections to separate your money from your phone, pens and other necessities. Designed with four card holders, a zip pouch and slip pockets. Pros: It's simple but elegant. You might enjoy the separated compartments keeping your things neat and orderly. Cons: There aren't many card slots. We've compiled over 16 different styles of vegan wallets and where you can buy them. 8 Amazing Vegan Wallet Brands – Do You Know Them All?